Although clusters are regarded as important elements in economic development, the strong focus in the literature on the way clusters function is contrasted with a disregard for their evolutionary development: how clusters actually become clusters, how and why they decline, and how they shift into new fields and transform over time. Although recently new cluster life cycle approaches emerged, both empirical evidence and theoretical contributions on this topic are still limited. This book therefore contributes to broadening our knowledge on the life cycle and evolution of clusters both empirically and theoretically. 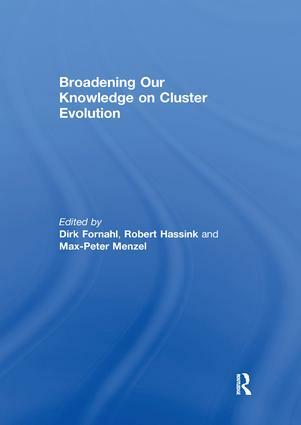 It contains chapters on inter-firm relations as drivers of cluster transformation, as well as chapters on the heterogeneity of firms and firm capabilities during cluster evolution and on the role of institutions in stimulating the emergence and growth of clusters. Case-studies stem from different industries and technologies, such as biogas, film and television, new media and medical technologies, and from different countries, such as Sweden, Austria, Switzerland and South Korea. All chapters underline that cluster evolution does not only depend on internal dynamics, but that external relations are an integral part of cluster dynamics. This book was previously published as a special issue of European Planning Studies.